FreshMarine.com - Chinese Golden Box Turtles - Cistoclemmys flavomarginata - Buy Chinese Golden Turtles Now and Save! Cistoclemmys Flavomarginata, commomnly known as Chinese Golden Box Turtle is a species of Asian Box Turtle and is one of the finest of all the box turtles. 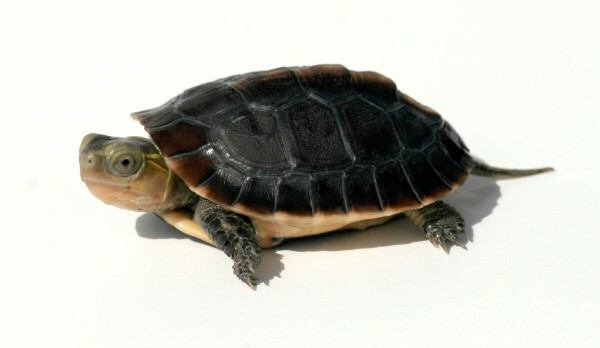 They are also known as Yellow-Margined box turtle or Golden-headed turtle. They have doomed shell and the carapace and plastron are dark brown in color with cream colored stripes on the vertebral keel. Due to the marginal scutes, the edge of the plastron is lightly pigmented. The skin of the limbs is brown in color whereas the top of the head is pale green but the skin under the head and in between the limbs is light pink in color. CistoclemmysFlavomarginata can bring the plastron to the edges of the carapace and due to this ability the name box turtle is bestowed upon this species. The pivot on the plastron and ligaments joining the carapace and plastron permit limited movement. This capability helps them against their enemies as they conceal themselves in their box when they sense any kind of danger. Their shell grows only up to 19 cm. The upper jaw of the Chinese Golden turtle is hooked to help feeding. The difference between male and female Chinese Golden Turtle is not very major. Males only have a broader tail than females which is almost triangular in shape. The courtship happens in land and not water in late spring and summer. They dig numerous holes for nesting and they are up to 4 inches deep. Only 1 to 3 eggs per clutch are laid by females. This species is found in ponds and overgrown streams of southern China, Taiwan and on the Ryukyu islands of Japan. These turtles prove to be great and easy pet and can be kept with other species of box turtle. Their indoor enclosure should be 36 inches by 12 inches and should be mater proofed. Plain sterile potting soil mixed with finely shredded orchid bark can be used to create land area. Hiding places using wood, cork bark slabs should also be created. A water area is also essential which should be both huge enough for the turtle to lie in and shallow enough for it to simply climb in. A heating pad should also be installed to maintain the temperature of the enclosure between 70 and 88 Fahrenheit. Full spectrum light is also required which will help the turtle to metabolize vitamin D3. This species is omnivorous and can eat a large variety of foods. Adults eat all kinds of worms like earthworms, mealworm and also snails and snugs. Dry trout chow and moistened dry cat food can also be added in their diet. Fruits like strawberries, bananas, papaya and vegetables like grated carrots, corns are also fed to them. Leafy greens should be ignored. Calcium rich food items like cuttlebone, boiled and crushed eggshell are also good for their health. They also hunt for invertebrates like June bug larvae and slugs which are their principal prey.